Gardeners can choose from among many conifer seedlings for their landscape. Conifers bear cone-shaped seeds and remain evergreen, providing year-round color in the landscape. Cedars, firs, pines and many, many other common trees are conifers. They make great additions to the garden and conifer seedlings are an affordable means to add more to the landscape. Conifers are wonderful trees and are well-suited to cooler climates. The typical conifer tree features a tall, evergreen tree with downward-sloping branches. This natural adaptation makes it easy for snow to tumble off the branches, which prevents heavy snow accumulations from breaking their branches. Most species of conifers grow in the northern hemisphere, and they grow naturally in vast forests on the slopes of mountain ranges. Each tree and shrub from the list above offers different benefits to the home landscape. Junipers provide lovely colored branches ranging from bright green to greenish-blue. They are also available in many shapes, from upright to the creeping blue rug Juniper that covers the ground with its green branches. Pines are often grown for their appearance, but some are grown specifically as a crop. Loblolly pine, for instance, which grows readily in the southeastern United States, is a fast-growing pine tree whose softwood is used by the paper industry. What garden zone are you in? There are conifers for almost any garden zone, and your local garden center probably carries varieties best suited to your climate and zone. 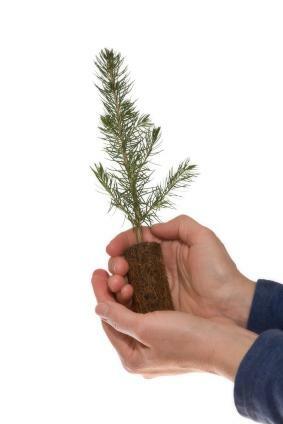 Where will you plant your conifer seedling? Look at the final mature height of the plant and consider the spread of the branches. If you're planting a conifer in front of your home, choose a smaller conifer or plant it well away from the house. How long are you willing to wait for the plant to mature? Some conifers grow quickly, while others grow more slowly. Consider the plant's use. If you're trying to plant a row of conifers to screen out the neighbor's backyard, choose a fast-growing conifer. If you're just looking for a specimen plant for the landscape, then you have more of a choice. When purchasing seedlings, you'll need to tend them carefully after planting. Frequent watering is essential during the plant's first year to help it establish strong roots. Mulch applied in a thick layer around the base of the tree helps retain water. Adding a hefty dose of compost to the planting hole will also help the tree by providing a natural source of slow-release nutrients. Conifer seedlings range from flat seeds hidden among the ridges of pine cones to the bright red berries of the yews. You can try to grow your own conifer seedlings, but you can also purchase them from a variety of sources. Chief River Nursery offers a good selection of hemlock, spruce and other conifers. Purchase seedlings or plants that are several years old from their website. Itasca Greenhouse offers a huge selection of conifer seedlings. While you must order more than one, they offer mix and match seedling selections and a variety of sizes. You'll find larger seedlings that may be easier to grow as well as inexpensive, smaller sized seedlings. The Arbor Day Society is a nonprofit association dedicated to planting trees. They offer conifer and other evergreen seedlings, and money spent on their trees goes to their efforts for conservation and education. In addition to these online sources, you can find plenty of conifers at nursery and garden centers nationwide. Contact your local County Cooperative Extension Office for a list of conifers native to your area or those that grow best in your gardening zone.